An intermediate Latin reader with high-interest stories from Greek and Roman mythology, complete with grammatical/vocabulary help that boosts reading speed and reader confidence. The level of difficulty is graduated, with earlier stories being easier than those that come later. All stories are patterned after ancient authors: a perfect way to ease into advanced and author reading courses. Bonnie A. Catto, Latina Mythica. Wauconda, IL: Bolchazy-Carducci, 2006. Pp. xiv, 201. ISBN 0-86516-599-8. $24.00. Reviewed by Tracy Deline, University of British Columbia (deline@interchange.ubc.ca) Word count: 829 words ------------------------------- To read a print-formatted version of this review, see http://ccat.sas.upenn.edu/bmcr/2006/2006-04-24.html ------------------------------- Latina Mythica is a graduated Latin reader designed for pedagogical use. It contains twenty stories, in prose, of varying length (17-91 lines) based on Greek and Roman mythology, from the birth of the gods to the prelude to the Trojan war. The grammar assumed is based on the first twenty-two chapters of Wheelock's Latin. [] Students of any standard Latin text, however, will find this work accessible. All vocabulary is provided on the facing page or in the vocabulary at the end of the book. Some vocabulary is repeated from one chapter to the next for those who wish to read selected stories rather than reading the entire book sequentially. C.'s preface (p. ix) details precisely which grammatical constructions are assumed and which are not (e.g. ablative absolutes, indirect speech, and subjunctives). The text includes macrons throughout. Each chapter includes a number of features: (a) an introductory paragraph outlining the context for the myth, a feature which is very helpful for all those students who do not have a strong background in Classics; (b) a list of the ancient sources for the myth, mainly poetic, from which C. has drawn material for her version of the story; (c) grammar and comprehension questions; (d) discussion questions; (e) a brief section on the cultural influence of the myths. The grammar and comprehension questions are the sort that an instructor would ask in class; the presence of the questions already in the book will encourage students to learn to ask these questions of the text on their own. The discussion questions aim to engage students in an appreciation of the wider issues brought up in the stories, from ancient culture tidbits (e.g. What animal was normally sacrificed to Jupiter? ch. 4) to broad and provocative issues that could easily derail the class (e.g. Compare the Ovidian version of the flood with those in the Epic of Gilgamesh and the Bible. ch. 7). The final section in each chapter is a selective list of post-classical cultural influences of the myth on art, literature, and music, which reminds students that classical subject matter has influenced western culture for centuries and is still relevant in our modern world. C. has succeeded in providing a series of stories that are dynamic and intrinsically interesting as well as culturally and linguistically enlightening. The stories are paced well and have sufficient information for clarity and enough detail for interest. The stories are almost entirely narrative in form, so the lack of more complex syntax does not harm the presentation of the myth. My main criticism of C.'s reader is that the progression of increasing grammatical complexity is quite slow. This could be seen as either a strength, since students can read with speed and confidence through the early sections of the book and focus on enriching their vocabulary skills, or a weakness, since, in a course where new grammatical skills are presented continuously, a reader that does not progress at a matching pace is difficult to use in the classroom. A helpful feature might be to include a note with each chapter that specifies what new grammar is included, thereby allowing an instructor to see at a glance which chapters would be suitable to use at a given point in their class (analogous to that given in 38 Latin Stories). [] Because the more complicated grammar is generally glossed, this reader would be an ideal tool for a student studying independently. A few quibbles. In a few instances, a vocabulary listing has migrated from its designated place to the opposite column on the page (twice in chapter 3). There are also a few instances in which glosses were wanting, as for example, an idiomatic use of the verb duco in chapter 7. Most proper names are glossed; all should be glossed. In my experience, students have difficulty predicting the nominative form and the declension pattern of proper names, particularly Greek names (which abound in C.'s stories). A note about methodology. C. states explicitly that constructions which do not occur in the first twenty-two chapters of Wheelock's Latin will be glossed throughout the text. For example, since knowledge of indirect statement is not assumed, the indirect statement in line one of chapter 1 is glossed, but by line 23 of chapter 3 an indirect statement is present without a gloss, and subsequently simple indirect statements are used with some frequency. On the other hand, there is not a single ablative absolute in the entire text (a construction introduced in Wheelock's Latin before indirect statement). Having said that, it is very clear that C.'s reader is meant to be a resource alongside a textbook and does not intend to teach new grammar. On the whole, this reader is a success, and the content of the stories themselves balances out any minor shortcomings in syntactical content. I look forward to using Latina Mythica in my own teaching. The book is pleasing in size and appearance, and the price is within reach of student budgets. ------------------ Notes: 1. Wheelock's Latin, sixth edition, revised by Richard A. LaFleur. New York: HarperCollins Publishers, 2005. 2. Groton and May, 38 Latin Stories. Wauconda, Illinois: Bolchazy-Carducci Publishers, Inc., 2001. ------------------------------- The BMCR website (http://ccat.sas.upenn.edu/bmcr/) contains a complete and searchable archive of BMCR reviews since our first issue in 1990. It also contains information about subscribing and unsubscribing from the service. Please do not reply to this email as this is an unmonitored mailbox. You can contact us by sending e-mail to bmr@ccat.sas.upenn.edu. 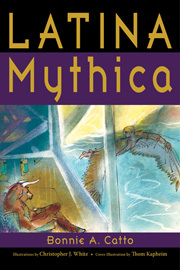 Latina Mythica Bonnie A. Catto Bolchazy-Carducci Publishers 1000 Brown Street, Unit 101 Wauconda, IL 60084 0865165998 $TBA www.bolchazy.com Enhanced with illustrations from Christopher J. White, Latina Mythica by Bonnie A Catto (Professor of Classics, Assumption College, Worcester, Massachusetts) is a highly accurate collection of classic Roman Mythology excerpts in Latin. Inclusive of grammar and comprehension questions, discussion questions, cultural influences of each myth in art, music, ballet, and literature, ten original black and white illustrations, map of place names mentioned in the myths, genealogical charts, list of ancient sources cited, bibliography, and an end vocabulary, Latino Mythica is a superb learning tool, and very strongly recommended for all students of the Latin language, as well as Roman culture and myth. Also strongly commended to Latin Studies collections is Professor Catto's earlier work, Lucretius. Selections From De Rerum Natura.